If you're indecisive you should probably avoid the menu at Sancho Pistola’s. 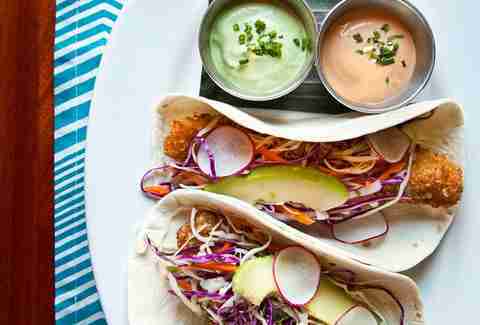 Like older brother Jose (Pistola’s), the Fishtown restaurant can present a challenge with a menu of over 15 different types of tacos, ranging from your standard chicken, to the more unconventional Pastrami. If those choices aren’t enough, Sancho Pistola’s also runs the Fishtown Taco Exchange, a collaboration with local chefs that features one-off taco creations. Wait too long at Pats / Genos? Skip the lines (and tourists) and head to Taqueria Los Taquitos de Puebla only a few blocks away for its Taco’s Al Pastor -- easily the best meat-on-carb dish in the area. Crispy, sweet, spicy, and a little fatty, at $6 for 3, these pork tacos are the perfect dish to inhale while laughing at all of the chuckleheads waiting in line for a mediocre steak. Originally started as a food truck serving breakfast tacos by Drexel grad Tom McCusker, Honest Tom’s expanded the operation to brick and mortar with its location in University CIty. While you can still get the famous breakfast tacos (a perfect hangover food), the lunch menu also features your choice of two chicken, pork, beef, sweet potato, or steak tacos all for under $7. If you are looking for Asian-fusion tacos or taco shells made from nacho cheese chips, head somewhere else. 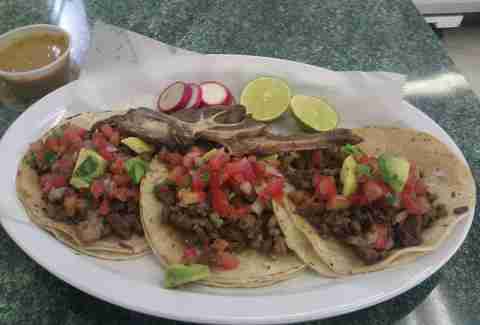 At Los Gallos, you’re getting straight, authentic Mexican food at cheap prices -- but that food is really good. 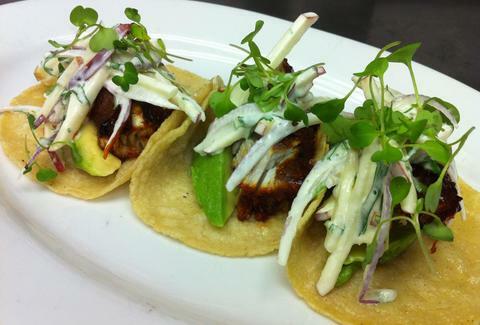 We’re fans of its pescado (fish) tacos made with tilapia, or any of its selection of rancheros tacos, featuring your standard asados (grilled) options. 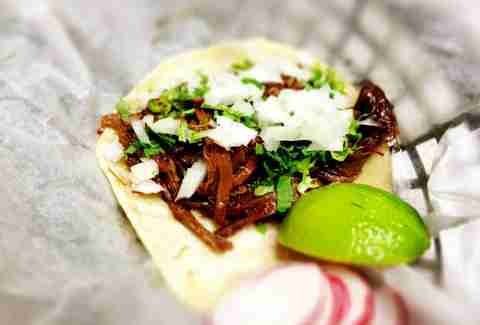 Or go bold and order one of its tripe or beef tongue tacos. You won’t confuse anyone for Andrew Zimmern, but you might impress your dining partner. As a self-described "defunct Fishtown dive retooled into a friendly neighborhood pub ‘n taqueria", Loco Pez is what you expect of a lot of other Fishtown spots: good food, reasonable prices, and a good drink selection (in this case, Tequila). The tacos are on the smaller side, but at $3 a piece -- or $1 if you are smart enough to come on $1 Taco Day -- it’s a great place to come if you are indecisive and want to try a few different varieties. Add in the potential for free-flowing tequila, and it’s easy to overindulge at Loco Pez. Free chips with two types of salsa. Check. 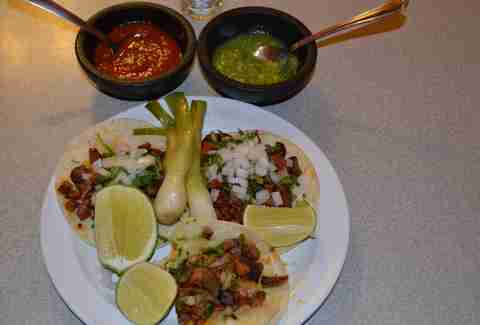 Tacos served with only cilantro and onions. Check. Two, not one, corn tortillas per taco. Check. South Philly’s El Jarocho touches all the marks for a quality taqueria (including the occasional telenovela on TV). 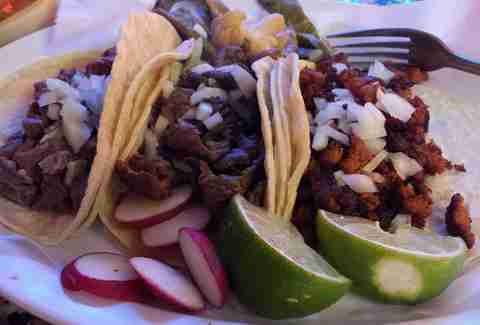 Prices are reasonable and the food is great, especially its chorizo tacos. Nothing to complain about here. A can’t miss on the menu are the cemitas -- a meat and vegetable sandwich served on a seeded Pueblan roll. For a slightly more upscale taco experience, head to Stephen Starr’s Mexican outpost in the heart of Gayborhood. It will be more expensive than your local taqueria but it’s always crowded, the drinks are great, and the food is consistently good. Mr. Starr knows what he’s doing. 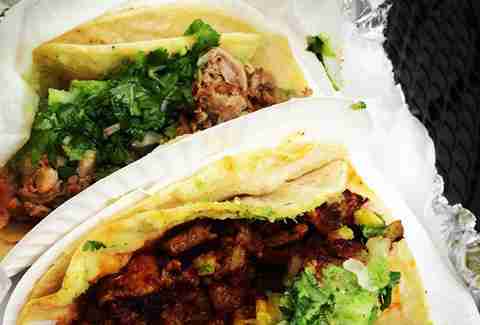 If you’re tired of the standard, homestyle taqueria fare and are looking for something more inventive, head to Fairmount’s Las Calaca Feliz. 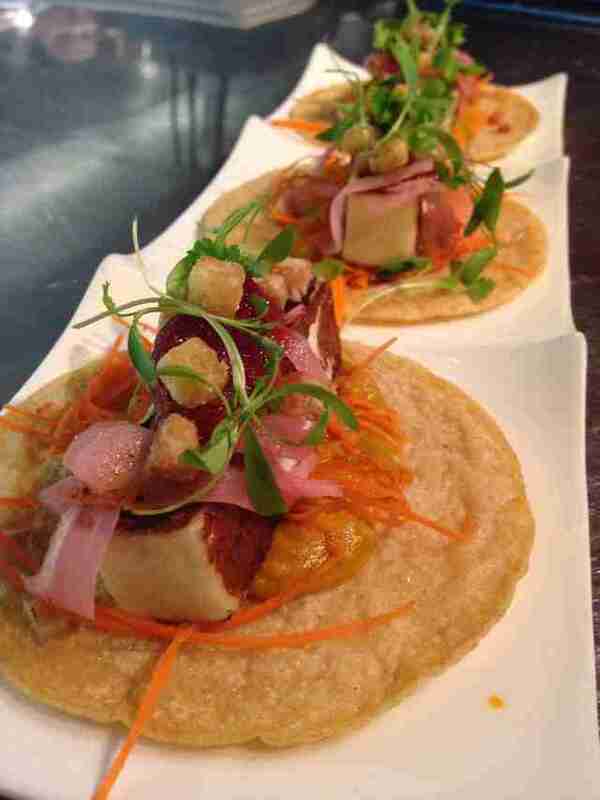 The menu, from former Garces chef Timothy Spinner, focuses on contemporary Mexican food with choices like plantain crusted tilapia tacos and soy chili glazed pork tacos. It also has a great outdoor patio for some alfresco dining this summer. Catering to college students and professionals, the Don Memo food is a West Philly favorite for the local lunch crowd. There’s always a line -- technically a good thing -- and for $7 you can have your choice of asada (steak), pollo (chicken), pastor, or carnitas tacos. 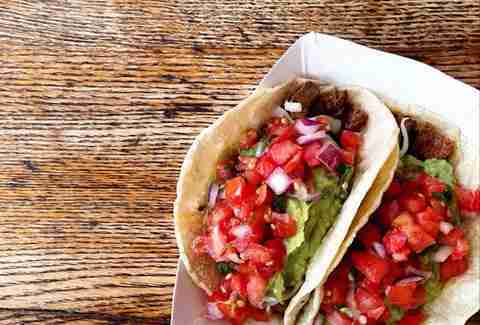 Cheaper and more authentic than your lunch would be if your ordered from a burrito chain. 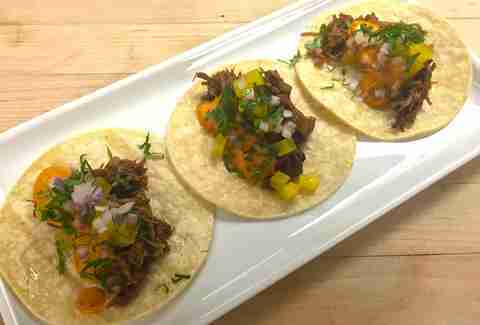 If you find yourself without a shore house this summer, at least there is one thing (outside the beer gardens) that you’re bronzed friends will miss out on -- delicious tacos from South Philly Barbacoa. The food cart, operated by husband and wife duo Cristina Martinez and Ben Miller, is only open on the weekend and choices are limited. 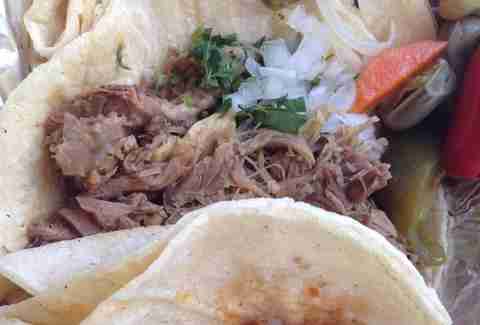 But when barbacoa lamb or pancita tacos are on the menu, there’s not really a need for anything else. For those missing out on the weekends, South Philly Barbacoa has been doing pop-ups recently with local chefs and restaurants. Dan McKay is a freelance writer/photographer living in Philly. He was once the fastest kid in second grade but now gets winded walking up the Rocky steps. You can follow him @dannypageviews.